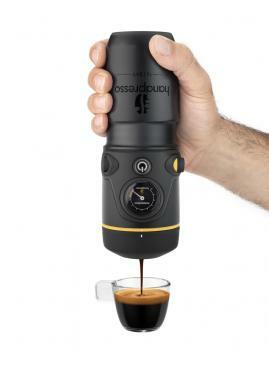 The Handpresso is a portable espresso maker powered by your car, but for what purpose? I haven’t quite figured that one out for myself yet, especially when it’s selling for over a hundred dollars at Amazon. It’s a cool gadget, but one of those things I see using once or twice and then forgetting about. Being powered by a car’s cigarette lighter gives it some nice mobility, but you do still need to plan ahead – you need to have water and an espresso pod (E.S.E pod) on hand, and if you’re that good at planning you could instead just plan on driving by a Starbucks to grab some espresso there. It’d work well for camping perhaps. While this does require the use of pods, keep in mind that you can make your own pods instead to save money and also maximize quality.